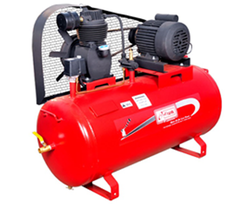 Our range of products include air compressors. Cylinders are with deep radical fins on outer side for quick heat dissipation. Finger valves, concentric disc valves, plates & springs are quickly acting for better performance. Forged steel connecting rod with needle bearing for heavy duty operation. Crankshaft with double end ball bearings for long life service intervals. Less noise level and ease of maintenance. Looking for Single Stagr Air Compressor ?